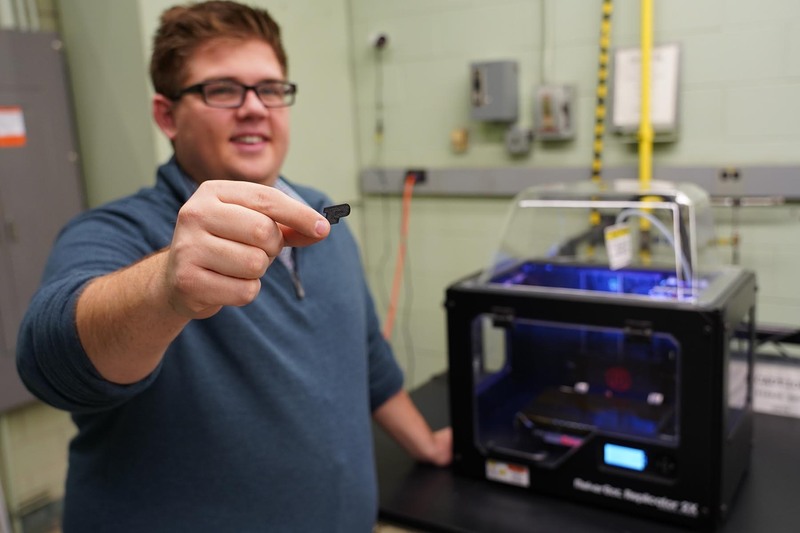 A Purdue team has taken advantage of the "boom" of 3D printing to create a 3D-printed "boom"... energetic materials that can safely be deposited using any commercial 3D printer. The most common form of 3D printing is called “fused deposition modeling,” where a reel of plastic filament is heated to its melting point, and then extruded onto a moving plate to form the desired shape. But energetic materials (pyrotechnics, explosives, and propellants) are extremely sensitive to changes in temperature. How can a 3D printer accurately deposit them? “There are two breakthroughs here,” said Jeffrey Rhoads, professor of mechanical engineering, and principal investigator. “First, we embedded the reactive material, aluminum, in a fluoropolymer plastic. Second, we went through numerous experiments with the 3D printing settings to determine exactly what speeds, layer heights, and other criteria we can adjust to print this material safely and accurately.” Their successful research was published in the journal Additive Manufacturing. This collaborative effort includes energetic material expertise from professor Steve Son; Emre Gunduz (formerly of Purdue's Zucrow Labs, now at Naval Postgraduate School in Monterey, California); and printing expertise from professor George Chiu. The group have launched a startup company called Next Offset Solutions, which builds upon their previous experience with 2D inkjet-printed thermite, and 3D printing of extremely viscous materials. Please note: the print samples depicted in the photos/video are of inert material, for illustration purposes only. This paper demonstrates the ability to 3D print a fluoropolymer based energetic material which could be used as part of a multifunctional reactive structure. The work presented lays the technical foundation for the 3D printing of reactive materials using fusion based material extrusion. A reactive filament comprising of a polyvinylidene fluoride (PVDF) binder with 20% mass loading of aluminum (Al) was prepared using a commercial filament extruder and printed using a Makerbot Replicator 2X. Printing performance of the energetic samples was compared with standard 3D printing materials, with metrics including the bead-to-bead adhesion and surface quality of the printed samples. The reactivity and burning rates of the filaments and the printed samples were comparable. Differential scanning calorimetry and thermal gravimetric analysis showed that the onset temperature for the reactions was above 350 °C, which is well above the operation temperature of both the filament extruder and the fused deposition printer.